Public Vote Function Now Active! 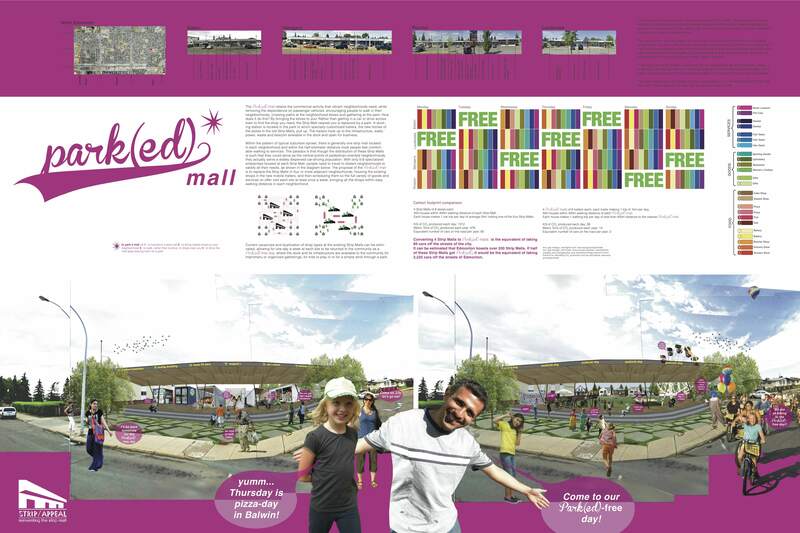 Have Your Say in the Strip Appeal Strip Mall Design Competition Public Choice Vote! You can vote for your favourite from the shortlist and have your say in the Public Choice Winner. 1. each submission has a vote icon. 2. votes are made by clicking on the icon of a chosen submission and voters will be asked to give their email address. 3. an email will then be sent to the provided email address where voters will be asked to confirm their vote, directing them back to the website. 4. only one vote from an email address will be counted. 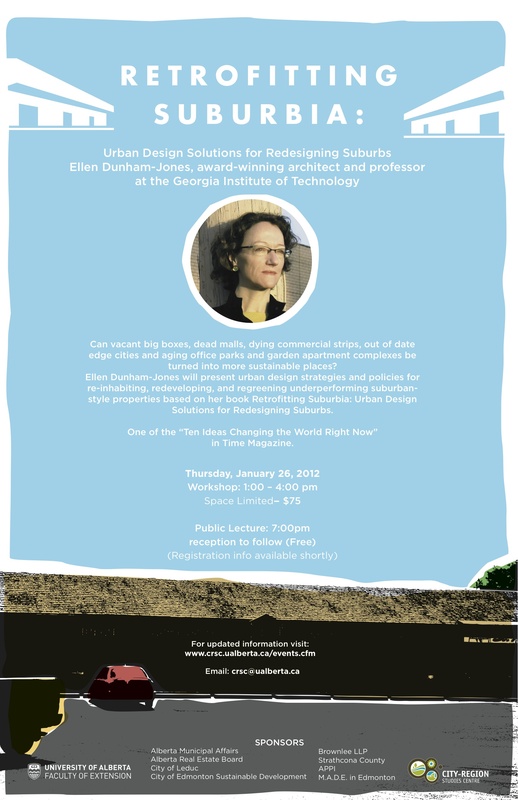 Please join Dr. Rob Shields and Dr. Merle Patchett for the announcement of winners for Strip-Appeal in the Atrium, Enterprise Square, 10230 Jasper Ave, Monday Jan. 16 2012, 5-7pm. Snacks are being provided from Nomad Food Truck and wine from Devine Wines (cash bar). As of Monday (9th Jan) you can vote for your favourite from the the Strip Appeal Shortlist and have your say for the Public Vote Prize! The public vote will run till Monday Jan 16th at 12 noon MST. The Jury has decided… but we are keeping you in suspense! The Jury have met and made their decision regarding the Winner and Runner Up. 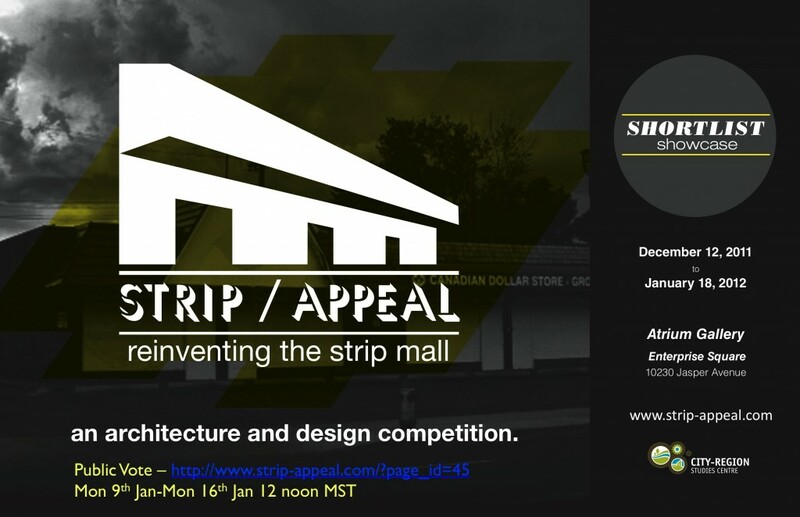 We are going to keep you in suspense however as we want to make the announcement in tandem with the Public Choice winner at the Strip Appeal Announcement Party on Jan 16th. The voting for the Public Choice winner will begin in early Jan through the website so stay tuned! We are also deciding on another 20 ‘notable’ submissions that will be featured in an website gallery. These 40 submissions (the shortlist and the notables) will then be open to the public vote from Jan 10th-17th. In the future we hope to have all 100+ submissions archived an available to view on the website. Stay tuned for more ingenious Strip Appeal entries! The shortlist has been decided and those who made the list have been contacted. The standard of submissions was extremely high, so much so that the selection committee decided on a shortlist of 20. The shortlist reflects the range in innovation and approach that was present across all 100+ submissions. Unfortunately, due to the high level of submissions, we are not able to contact eveyone who entered individually. We would like to take this opportunity to thank all of you for your submissions and for sharing your great ideas and design work with us. We are keeping all of your submissions on record as we may ask to use your work at a later date as part of the bookwork or traveling exhibit. The shortlist will be on display in Enterprise Square Galleries from 12th Dec-18th Jan 2012. We will also be displaying the shortlist digitally and online using the WAVE technology center. We hope to be adding more submissions to this format for the public vote after Christmas. You will be contacted if your work is to be included.